Home Resource Free raywenderlich.com Books for Meetups and Conferences! Do you organize or attend any meetups or conferences on things like iOS or Android development, Unity game-building, Swift, Kotlin or other topics we cover on this site? If you answered “yes”, then please sign up for our raywenderlich.com Free Loot program and we will send you two free books from our site to give away at your event! 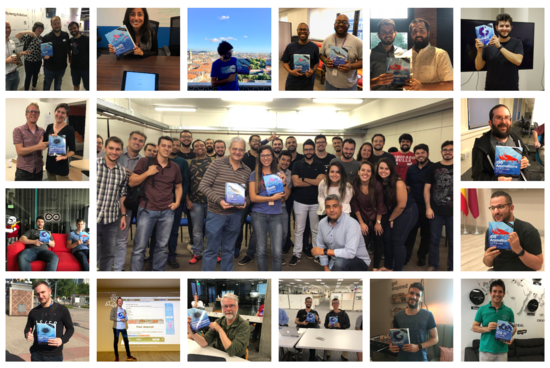 We’ve been beta testing this program over the past year, and we’re happy to announce that we’ve now sent books to over 100 meetups and conferences from all around the world! 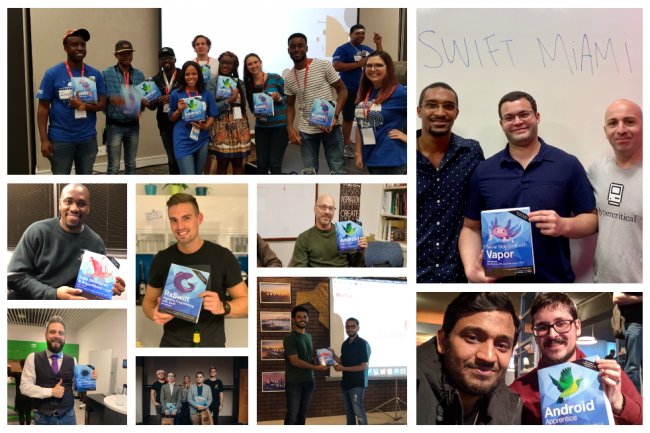 Your meetup or conference must be focused on iOS, Swift, Android, Kotlin, Server Side Swift, or Unity. And even if you aren’t the organizer, you can still sign up — I’ll simply ask you to introduce me to the organizer at a later time. But please understand this program is not for individuals – it is for meetup groups and conferences only. After signing up, check your email for a note from me with further instructions. When you receive your books, you can run the giveaway at your meetup, conference or event in whatever manner you’d like. I only ask for one thing in return: After you select the lucky winner, please tweet a selfie of the lucky winner to @rwenderlich. That way, I’ll know the book gone to a good home — and I can retweet it to give your group some exposure! We look forward to meeting more of you through our Free Loot program — and we can’t wait to see some pictures of future lucky winners!